Hamilton got away cleanly and looked to have his hands full with a feisty Verstappen behind. 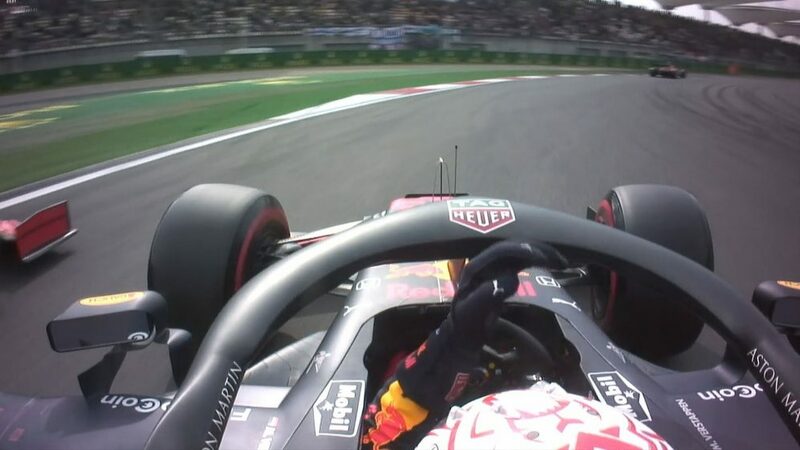 He pitted early for medium tyres but was a sitting duck when Verstappen emerged just behind him on a fresher and faster compound. That was the lead gone... or was it? 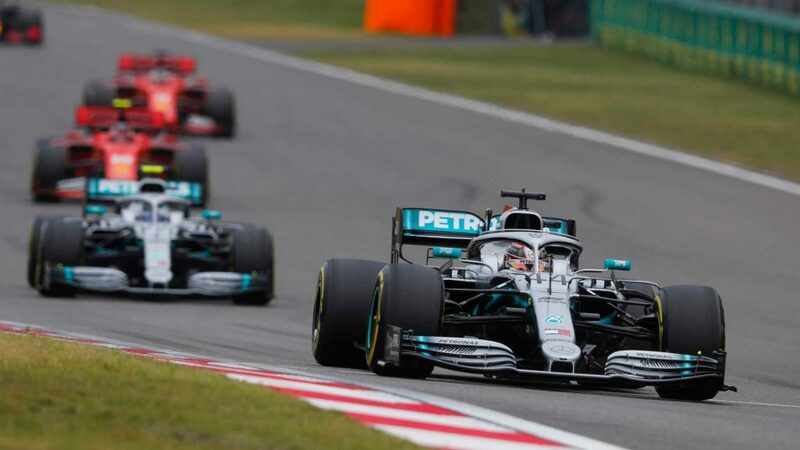 Hamilton capitalised when Verstappen spun ahead to grab an unlikely-looking tenth victory of the season to secure Mercedes another constructors’ title. Bottas struggled with tyre wear throughout and limped home fifth, bemoaning his "s***" race on the radio. "That's real history in the making for the team. If I were to stop today with Mercedes, I would always remember this day and that I was a part of it and that's so cool. This has been a seriously tough year and everyone on this team has fought so hard, harder than we've ever fought and we're the most united that we've ever been - which is not expected when you've had success in previous years and could easily drop the ball. The guys have been continuing to raise the bar. Today was such a tough race for me, but I really wanted to deliver and win this for the team. It has such a big knock-on effect; everyone on the team can now go into the last race and into the winter, knowing that they won the world title and that they're legends. I am so grateful for all the hard work - here at the track, back home at the factories, at PETRONAS and all of our partners - I'm so proud to be part of this team. I'm actually kind of nervous to go back to the factories and hear the roar - I think the atmosphere is going to be incredible. I didn't expect the Red Bulls to be in the race like that today, I thought they'd be in a similar pace to us, but they were quite a bit quicker. We struggled with the tyres in the first stint and they were able to manage the tyres better than us. In the second stint, I was on the Medium tyre and had an issue with the engine, so I was really just trying to bring the car across the line. Max passed me which was painful, but then they had an issue and all of a sudden I was back in the lead. I was on the radio, telling my engineers "I don't want to give it up, tell me what I need to do" - I was pushing so hard at the end, taking every risk to bring it home with a win. This is a high, but I want to stay on that wave and win the next race as well." "I'm really happy and proud to be part of this team. This is down to hard work by every single team member, both back at the factories in Brackley and Brixworth as well as here at the race track - they really deserve this title! It's usually only a few people who are in the spotlight all the time, but there are many, many hidden heroes in our team - thank you all! We kept everything together even under immense pressure, minimised our mistakes and did a great job developing the car - huge congratulations to everyone. The race today was a bit tricky; everything went as planned at the start and we could gain the lead at the beginning, but after that it got more difficult. In the first stint, I was struggling with overheating the tyres, in the second stint, I was struggling with blistering on the Mediums, so we had to stop a second time. I think we didn't quite have the pace today. It was a slightly tougher race than I expected, I was a bit more optimistic before the race, but overall it is a great day for Mercedes." "This is an amazing, amazing group of people built up over many years. The skill and the dedication in a sport that is famously complicated - to get all those ducks lined up in a row, not just once or twice but season after season - is just incredible. What was difficult about this season is that the opposition were that quick. We came to the races not knowing if we were going to win, not having any idea whether they were going to smash us. It ebbed and flowed all through the year. We thought we had them punched down so many times - only for them to bounce back up and give us a really tough time, and it's still happening now. The fact that this year has been so desperately close shows that the difference between the teams is utterly tiny - and it was Lewis who made the difference for us this year. He keeps putting it on pole, in the races we can make mistakes and he'll recover it by doing something unlikely on the track that no-one sees coming and he's spent the whole year not making mistakes. 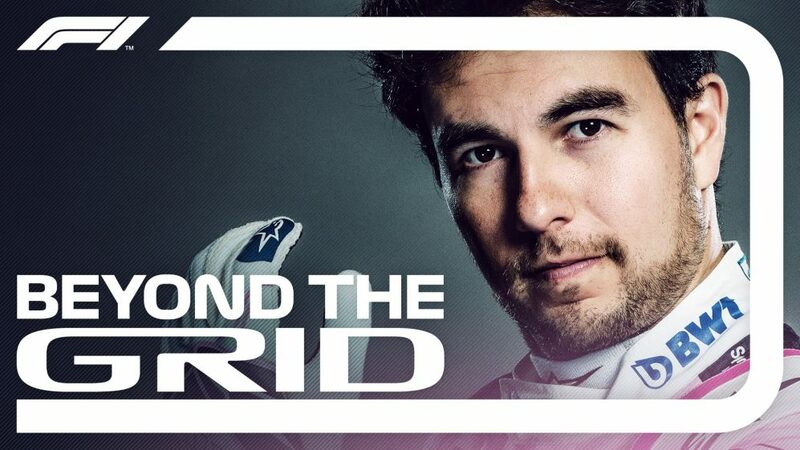 He's just the consummate racing driver. We're very lucky with the driver partnership that we have. Valtteri had a lot of bad luck at the start of the year when he might have had some race wins and has not had the same success that Lewis has had. Valtteri has been stronger this year than he was last year, he's been a brilliant team mate to us all and a huge asset." "We just wrote Championship history - but winning the fifth double World Championship feels so surreal. Who would have thought this would be possible when we embarked on this mission eight years ago? If anyone had mentioned this record back then, we would have told them they are crazy. And yet, here we are today, having just equalled the Ferrari record from the Schumacher years. It's a great honour to represent Mercedes on the track and I can't thank everyone enough for their great work, both here at the track and in Brackley and Brixworth, and also for the continued support from Daimler in Stuttgart and PETRONAS in Kuala Lumpur and Turin. None of this would have been possible without their contributions and without the hard work and the passion of everyone on the team. 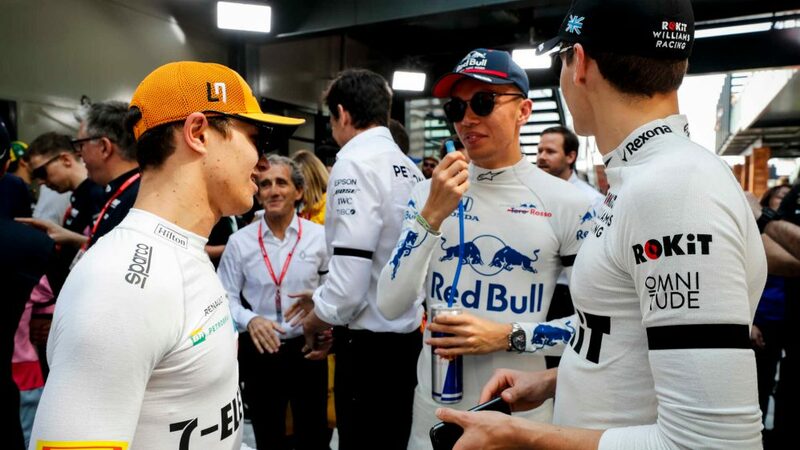 I had a conversation with Lewis on Sunday night in Mexico; he had just won his fifth world championship, but both of us were not fully satisfied - because our objective was to win both titles. That's why he was fighting so hard today because he wanted to finish this on a high, win the race and win the constructors' championship for the team. 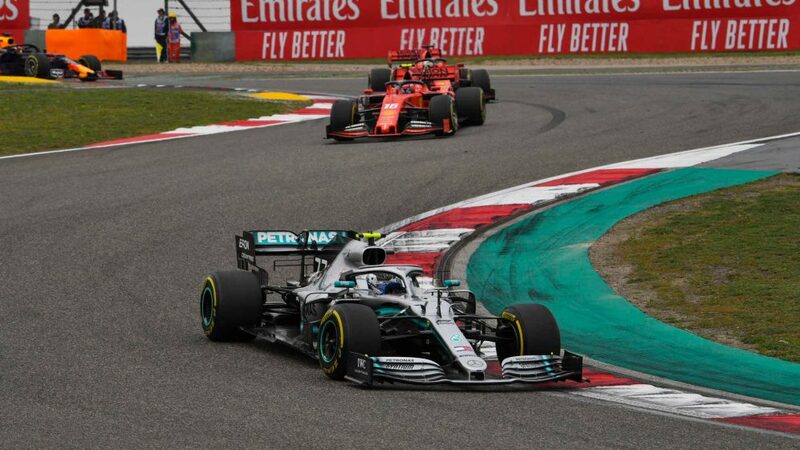 Valtteri had a trickier season than Lewis, but he has improved his performance this year and played a vital role for this championship success. Five consecutive titles - I'm immensely proud of this amazing achievement." Lewis Hamilton, Mercedes AMG F1 and Valtteri Bottas, Mercedes AMG F1 W09 EQ Power+ celebrate in Parc Ferme at Formula One World Championship, Rd20, Brazilian Grand Prix, Race, Interlagos, Sao Paulo, Brazil, Sunday 11 November 2018. Race winner Lewis Hamilton, Mercedes AMG F1 celebrates on the podium with the champagne at Formula One World Championship, Rd20, Brazilian Grand Prix, Race, Interlagos, Sao Paulo, Brazil, Sunday 11 November 2018. Lewis Hamilton, Mercedes AMG F1, Valtteri Bottas, Mercedes AMG F1, Toto Wolff, Mercedes AMG F1 Director of Motorsport and the Mercedes-AMG F1 celebrate clinching the Constructors Championship at Formula One World Championship, Rd20, Brazilian Grand Prix, Race, Interlagos, Sao Paulo, Brazil, Sunday 11 November 2018. “After having fantastic pace in the race today it’s incredibly disappointing to lose the victory with Max following what can only be described as irresponsible driving from a backmarker. Nevertheless, we had phenomenal pace which was demonstrated by both Max and Daniel. 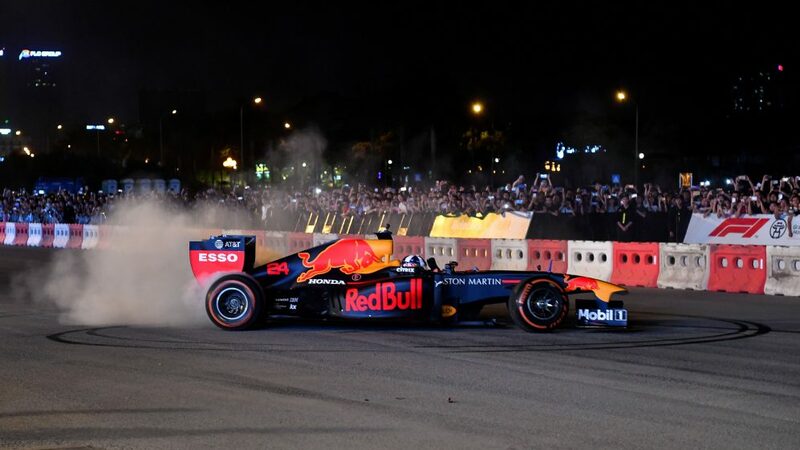 Race leader Max Verstappen, Red Bull Racing RB14 crashes whilst lapping Esteban Ocon, Racing Point Force India VJM11 at Formula One World Championship, Rd20, Brazilian Grand Prix, Race, Interlagos, Sao Paulo, Brazil, Sunday 11 November 2018. Daniel Ricciardo, Red Bull Racing RB14 and Sebastian Vettel, Ferrari SF71H battle at Formula One World Championship, Rd20, Brazilian Grand Prix, Race, Interlagos, Sao Paulo, Brazil, Sunday 11 November 2018. Perez had a quiet race, coming home well adrift of the Haas boys but managing a point at least. But the Mexican is hardly the news story. Ocon was down at the back of the pack and had just been lapped by the race leader for a second time. He asked permission to unlap himself as he had fresher tyres. Force India said yes, he pulled up alongside Verstappen and... there wasn’t enough tarmac to go round. The collision lost the Dutchman the lead and landed Ocon with a ten-second stop-and-go penalty. They blamed each other, exchanged heated words post-race and certainly won’t be sharing a plane home on Friday night.... or in the future. Sergio Perez, Racing Point Force India VJM11 in Parc Ferme at Formula One World Championship, Rd20, Brazilian Grand Prix, Race, Interlagos, Sao Paulo, Brazil, Sunday 11 November 2018. Vettel struggled off the line on the formation lap, which foreshadowed his race. Overtaken by Bottas and Verstappen at the start, even his team mate got past as the German couldn’t extract any pace from his soft tyres. He ended up two stopping on his way to a disappointing sixth. Raikkonen, though, showed a good turn of pace to overtake Bottas and grab third. 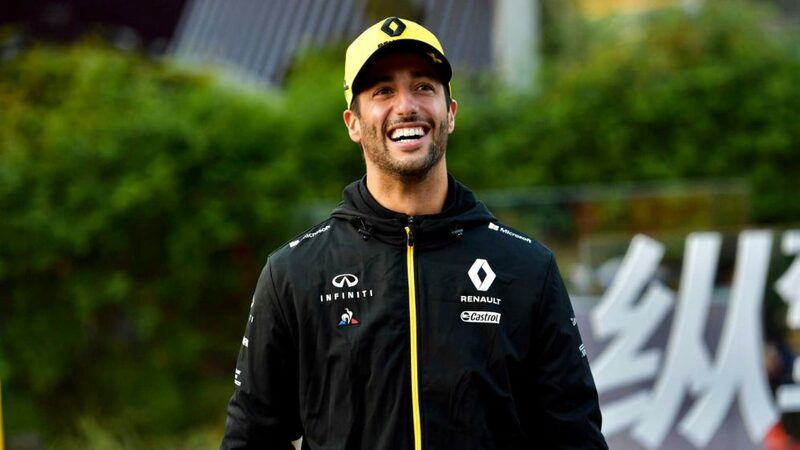 He had to work hard to keep a speedy Ricciardo behind in the closing stages, but defended well to grab his 12th podium of the season in his 150th race for the Scuderia. "Obviously, this was not an easy race and I am not happy with sixth place. 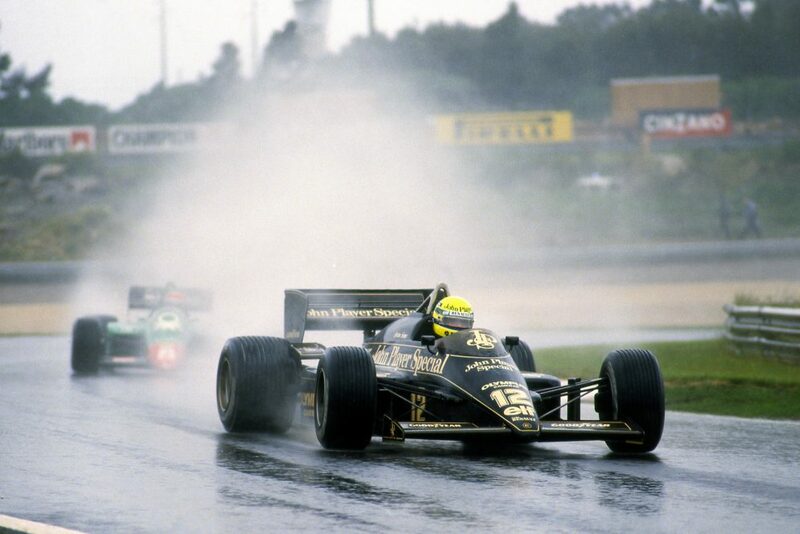 I tried to do my best, but the car was difficult to drive and I even struggled to drive on the straights. However, I am happy that Kimi got to the podium, because it is a good result for us, even if we didn’t win the Constructors’ Championship. Honestly, I don’t think it was an advantage for us to start on soft tyres, because the supersofts lasted longer than expected, but that’s how it was. The first part of my start was going well, but then the second was not that good, as I had nowhere to go with Lewis in front of me. I think we just didn’t have enough grip in the second part of the “esses”, Lewis and Valtteri worked together and I had no chance. Also, Lewis was a little bit quicker on the brakes to give Valtteri the outside line and then in lap 2 or 3 Max passed us as he was faster. There’s not much to say as this year Mercedes has been stronger than us and we can only congratulate them." "It was a nice exciting race. We had good battles throughout and the car was working well during the whole race. The speed was there and we had no particular issues. The first set of tyres was very good at the start and I was really happy, but then I destroyed them a little bit trying to pass the Mercedes. Once we changed the tyres the car was absolutely fine; we kind of knew that once we pitted we could have gone past them. After that the behaviour of the car was still very good, but at that point we were a bit too late, as it had taken too long for us to get there. As for the strategy, we did what we thought was the best for us. We can always debate many things, but today we made the best of it. Obviously it is not the greatest of results, but I don’t think we could have got more; we did not make any mistakes and fought hard. As for the Constructors’ Championship we knew that it would have been difficult; we did our best, but unfortunately it was not enough. The best team won this year, that’s how it goes." "Unfortunately, even though Kimi finished on the podium today, we were unable to reach our goal, which was to keep the battle going for the Constructors’ title. Right from the formation lap, we became aware of a problem with a sensor on Seb’s car. This meant that, for the whole race, he had to run different settings to those we would have normally used and that made the car difficult to drive. Congratulations to Mercedes on taking the teams’ title." Sebastian Vettel, Ferrari SF71H and Daniel Ricciardo, Red Bull Racing RB14 battle at Formula One World Championship, Rd20, Brazilian Grand Prix, Race, Interlagos, Sao Paulo, Brazil, Sunday 11 November 2018. Kimi Raikkonen, Ferrari SF71H and Valtteri Bottas, Mercedes-AMG F1 W09 EQ Power+ battle at Formula One World Championship, Rd20, Brazilian Grand Prix, Race, Interlagos, Sao Paulo, Brazil, Sunday 11 November 2018. Ericsson had problems before the race even began when a chunk of his diffuser flew off on his way to the grid. He then collided with Grosjean at the start, suffered more damage and dropped down the field. A spin followed before he pulled into the pits lamenting an undrivable car. Leclerc profited from his team mate’s woes to inherit seventh, which he kept throughout the race, picking and choosing his battles wisely. Charles Leclerc, Alfa Romeo Sauber C37 at Formula One World Championship, Rd20, Brazilian Grand Prix, Race, Interlagos, Sao Paulo, Brazil, Sunday 11 November 2018. Marcus Ericsson, Alfa Romeo Sauber C37 and Romain Grosjean, Haas F1 Team VF-18 collide at the start of the race at Formula One World Championship, Rd20, Brazilian Grand Prix, Race, Interlagos, Sao Paulo, Brazil, Sunday 11 November 2018. Kevin Magnussen, Haas F1 Team VF-18 at Formula One World Championship, Rd20, Brazilian Grand Prix, Race, Interlagos, Sao Paulo, Brazil, Sunday 11 November 2018. 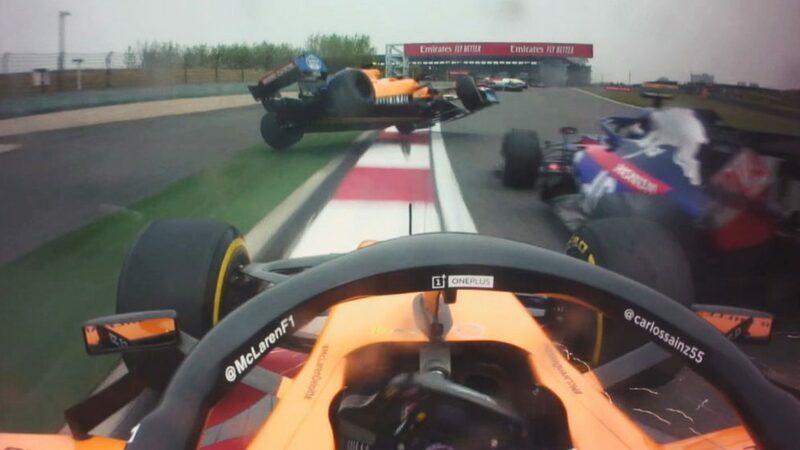 Hulkenberg and Sainz had an intra-team squabble on the first few laps and even barged wheels, which given their precarious position in the constructors’, won’t have overly pleased Renault. But soon they settled down, until Hulkenberg was pulled into the pits to retire with temperature issues. Sainz at least saw the chequered flag but came home a disappointing 12th. Nico Hulkenberg, Renault Sport F1 Team R.S. 18 pit stop at Formula One World Championship, Rd20, Brazilian Grand Prix, Race, Interlagos, Sao Paulo, Brazil, Sunday 11 November 2018. Esteban Ocon, Racing Point Force India VJM11 and Carlos Sainz, Renault Sport F1 Team R.S. 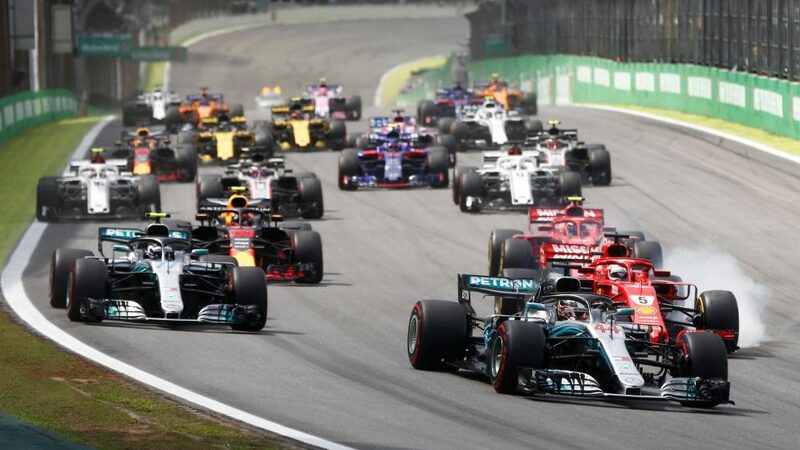 18 battle at Formula One World Championship, Rd20, Brazilian Grand Prix, Race, Interlagos, Sao Paulo, Brazil, Sunday 11 November 2018. Alonso was tetchy and scathing all through the race, and his mood wasn’t improved by being overtaken by his team mate. All in all, his final Brazilian Grand Prix left all concerned disappointed and he has one chance left to finish his F1 career in style. Vandoorne did finally have something to smile about with that overtake, until he was hit with a time penalty for a blue flag infringement along with his team mate. “It was tough today. We gambled a little bit on the strategy, stopping very early to overtake some cars in front, but it didn’t work out for us. As it turned out, the Medium tyres blistered and we weren’t competitive in the second part of the race. “Also, my pit-stop was not clean and smooth, and we lost some time there. “Today was a good race from my side. I’m really happy with how everything went, even though the result today wasn't really what we were hoping for. “It was a strong race from my side, and I felt like I maximised everything today. I had a few good overtakes and some nice fights with Fernando, and we overtook the Williams as well, so I think we did the most we could today. “This was a difficult race for us. Fernando had a good first lap, which put us in a better position. We decided to box him relatively early to enable him the opportunity to undercut some competitors, but unfortunately we had an issue during the pit-stop, which essentially killed his race, as any progress was marred by traffic and blue flags. However, had it not been for the experience of our pit-crew, who spotted the issue with the right rear wheel, the result could have been race-ending. Credit to the crew for their hard work, as always. “On Stoffel’s side, the beginning of his race was clouded by traffic, however, as the race went on he made steady progress, showing good pace in the closing stages, and finished in striking distance of 11th place. (L to R): Fernando Alonso, McLaren and Stoffel Vandoorne, McLaren on the drivers parade at Formula One World Championship, Rd20, Brazilian Grand Prix, Race, Interlagos, Sao Paulo, Brazil, Sunday 11 November 2018. Fernando Alonso, McLaren MCL33 leads Stoffel Vandoorne, McLaren MCL33 at Formula One World Championship, Rd20, Brazilian Grand Prix, Race, Interlagos, Sao Paulo, Brazil, Sunday 11 November 2018. This could be an awkward debrief. Hartley, on fresher faster supersoft tyres, was right up behind Gasly in the fight for P11. The team told Gasly to let him by. Lap after lap went by and the Frenchman wouldn’t budge whilst the Kiwi didn’t attack, believing he was being let through. Both drivers were having words on the radio to their respective engineers, and the airwaves were turning increasingly blue as both drivers vented at each other. It was all in vain as neither came home inside the points but... it was an entertaining exchange, if unedifying for the team. Pierre Gasly, Toro Rosso STR13 pit stop at Formula One World Championship, Rd20, Brazilian Grand Prix, Race, Interlagos, Sao Paulo, Brazil, Sunday 11 November 2018. Brendon Hartley, Scuderia Toro Rosso STR13 at Formula One World Championship, Rd20, Brazilian Grand Prix, Race, Interlagos, Sao Paulo, Brazil, Sunday 11 November 2018. Williams were off the pace in qualifying and couldn’t get involved in the action during the race either. They tried to one-stop both cars, but Stroll couldn’t make his tyres last and pitted late for a fresh set which dropped him to the back of the field. Sirotkin finished slightly higher but there aren’t many positives to draw for the team with one race left to salvage something from their season. "Straight away from the beginning, it was a very difficult race. We were missing the pace of the cars around us. It was tricky during the first laps, I felt like I was dancing on ice, not just to fight but even to keep the car on track. I was trying to protect the positions and it ruined the rhythm, so it took a while to settle down. We never really had the pace to recover so all race it was about survival. It was very difficult to manage and keep everything under control for such a long stint, so very disappointed after a tricky race." "It was a long, hard race. I had a good start and then I was just getting out of the way for blue flags and managing tyres, but ultimately that wasn't good enough as we were too slow. That is the nature of the track also, as it is very tight and there are not many corners, so it is tough to get out of the way. It was far from the most exciting race. The bottom line is we were not quick enough, and I am not sure we could have done anything with our strategy." "It was a frustrating race with lots of blue flags. We took a gamble with our strategy, stopping early to get both cars onto the prime tyre in an attempt to undercut the cars we were racing. Unfortunately, this didn’t pay off due to the degradation of the prime tyre and both cars progressively lost positions. These aren’t the results we were hoping for today, however both drivers drove well, within the limits of the car, and performed the necessary tyre management." Sergey Sirotkin, Williams FW41 at Formula One World Championship, Rd20, Brazilian Grand Prix, Race, Interlagos, Sao Paulo, Brazil, Sunday 11 November 2018. Lance Stroll, Williams FW41 at Formula One World Championship, Rd20, Brazilian Grand Prix, Race, Interlagos, Sao Paulo, Brazil, Sunday 11 November 2018.